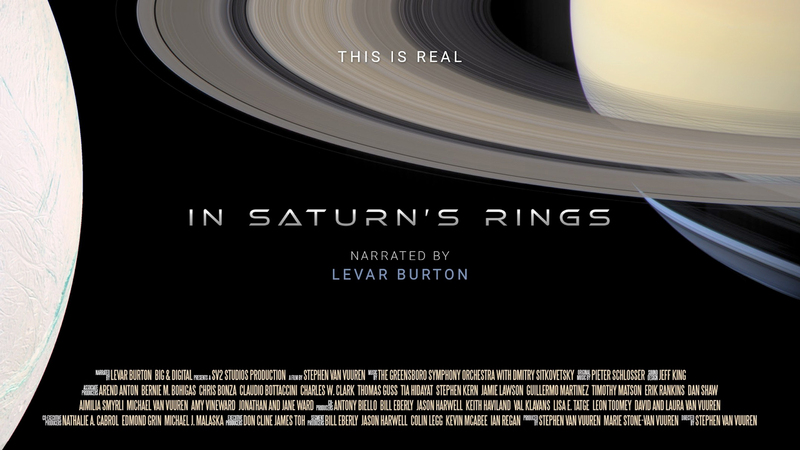 “In Saturn’s Rings” will have it’s world film festival premiere on April 13, 2019 at the Riverrun International Film Festival in Winston-Salem, NC. We have our world film festival premiere on April 13th at the Riverrun International Film Festival in Winston-Salem, NC USA. Filmmaker Stephen van Vuuren will present an extended introduction to the film and host a panel discussion with key volunteers with an audience Q&A after the film. Jason Harwell, the film’s Universe/Galaxy Segment Producer who worked tirelessly and brilliantly on the film leading the high resolution Hubble Galaxy images team. Dr. Steve Danford (Associate Professor and Director of Observatories, Emeritus Department of Physics and Astronomy at UNC Greensboro) who was the film’s science advisor for the galaxy sections. He was also Stephen van Vuuren’s college physic professor. Tim Martin, Earth Science Teacher at Greensboro Day School, who worked diligently on the team creating the educational guide for the film. Stephen van Vuuren, director and animator and general flunky who tried to not to mess up everyone else’s brilliant work. Riverrun is a top 10 Festival worth traveling for according to USA Today and Moviemaker Magazine ranked it in the top 50 in the world. Toolfarm is one of the Platinum Ring Sponsors, along with Red Giant Software, iZotope, and nVidia. Other sponsors are Adobe, Cinnafilm, Fotokem, Alfred Williams & Company, Digieffects, Mettle, the AE-List and more. Check out our previous midweek motivation post about “In Saturn’s Rings” here.